Glass ReSurfacer Final Polish effectively removes stage 1 and 2 corrosion, light surface scratches, oxidation, erosion channels, mineral deposits, calcium stains, lime stains, efflorescence, soap scum, acidic graffiti, oils, everyday grime and buildup, etching, acid burns, acid rain and other flaws from architectural glass surfaces. It is designed for use with a motorized polisher to produce a scratch-free and highly reflective finish on a wide variety of glass surfaces. The Glass ReSurfacer System is a complete package of everything needed for one technician to fully utilize the Glass ReSurfacer Final Polish. New Formulation now allows you to spray the product on the window for better coverage, less product waist, faster application, more water means less chance of the product drying on the glass before you can add water and a more uniform application of the product. Following restoration, we recommend the application of Presto’s Glass Defender® Series to seal the glass and preserve the newly restored finish for up to 20 years. Clean the window with a brush and squeegee removing all loose dirt and debris from the glass, frames, gasket and caulking joints. We recommend using deionized water. All dirt must be removed, as it can scratch the glass. Dry the frames and use masking tape to isolate the intended working area, making sure to apply it to areas that may receive overspray. Do not leave tape on the building overnight. Shake product well prior to use, and often during use. Always test all products and combinations of products in a small, inconspicuous area in direct sunlight prior to use. This product will produce a final finish on the glass. Use this product in conjunction with a motorized variable speed polisher or random orbital sander, backer pad, specialized Glass ReSurfacer pad and a spray bottle for lubrication. Always use a GFI when using electricity in close proximity to water. Always mix product by shaking or stirring well before use. Only a small amount of product is needed for an application. 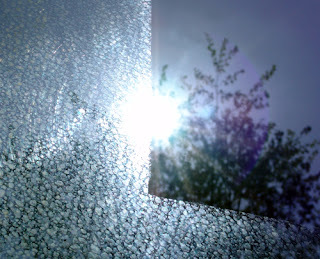 Spray the product on the previously cleaned window. Place the Glass ReSurfacer Pad flat on the glass, and begin polishing. The motorized polisher should be operated at 800-1200 RPM. Operate the polisher pressing firmly on the glass until the stain is completely removed. The use of suction cups allows the technician to stabilize oneself or the swing stage so that effective pressure can be applied to the glass while performing this process. The more pressure and speed used during the restoration process, the faster the results. The working surface must be kept moist using a spray bottle containing water (preferably deionized). The consistency of the product should be a milky paste as it is being worked on the glass. The product should not drip down the glass and should not cake up on the pad. The best result is produced when the perfect amount of product and water are worked on the glass. Experimentation is necessary to learn the perfect mixture for each specific application. Never allow any contamination in the form of dirt of sand to come into contact with the pad or the product. Stop frequently to examine performance and ensure no scratching is present due to contamination. Never allow the Glass Resurfacer Pad or polisher to touch the ground or any surface containing dirt or dust. If you notice circular pattern scratches in the glass, you have contaminated the pad or the product. If this happens, clean the pad to remove contamination. Proceed to remove scratches as outlined above. Extensive testing has been performed to ensure this product does not create scratches. If scratching occurs, it is not the product or the pad; it is due to the user’s application. Only qualified individuals should attempt to use this system. Using a random orbital sander in replacement of the variable speed polisher will reduce the chance of scratching; however, the glass resurfacing process may take longer and may not work as desired on heavily stained or lightly scratched windows. 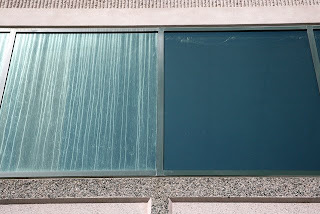 Caution: It is easy to scratch glass using this system incorrectly, and although the scratches can be removed using this same system, the time to remove these scratches can cause the project to run over estimated time and costs. Consulting and training are available from Presto. The corners of windows can be restored using a random orbital corner polisher or white synthetic, non-abrasive pads in combination with the Glass ReSurfacer Final Polish. Dry buffing or lack of water during the Glass ReSurfacer Final Polish will cause the product to cake and the pad will develop a buildup of material, slowing the resurfacing process. Use a stainless steel or copper (nonrusting) wire brush to remove excess material from the pad and continue restoration. It is necessary to clean the pad 1 to 3 times per window to maximize efficiency of the process. To clean the Glass ReSurfacer pad, operate the polisher upside down on slow and apply the wire brush to the pad starting at the center and slowly moving towards the edge of the pad until the entire pad is cleaned. Use the water spray bottle to rinse the pad and continue working. Maximum results are seen just after cleaning the pad. If you experience a slowing or halt in performance, stop and clean the pad as described above. For efficiency, have all equipment readily available to enable continuous operation. Use a spray bottle that can be attached to the technician so that the pad can remain on the glass while water or additional product is applied to the working surface. Respiratory equipment (fine particle dust mask) is required while using Glass ReSurfacer Final Polish. Take precautions to avoid inhalation of dry dust from this product. This product is designed for professional use and should only be used by qualified individuals. Be careful not to allow too much heat to buildup in one area during use or there is a slight possibility of breakage. The window to the left is shown prior to restoration. The window to the right is shown after using the Glass ReSurfacer Final Polish to remove mineral staining.